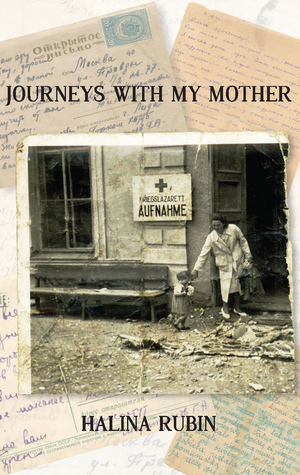 Journeys with My Mother is an extraordinary story: despite the author’s skill in telling it, I still can’t quite imagine how an indomitable woman twice managed to escape the Germans, each time with a small child in tow. It seems unbelievable and yet it is true. Halina Rubin was born to secular Jews in Warsaw in 1939 at the time when Hitler and Stalin had signed a non-aggression pact and Hitler was free to attack the city. As people who believed that communism was a viable alternative to the poverty around them, Ola and Wladek saw the Soviet Union as a refuge, and fled to Bialystok, just across the border, a once Polish town in Soviet hands thanks to the trade-off with Hitler. (The book has a helpful map at the front, that shows where these places are). If you have seen Roman Polanski’s film, The Pianist, you have some idea of the devastation wrought upon Warsaw and the horrors of the ghetto, but for Ola the disaster began just a few days after she gave birth. Her room was full of roses. Afterwards, she could not recall who else had visited her and who’d delivered the flowers. We were still in that hospital room when the war began four days later, when the real bombs started falling on Warsaw, when people were killed, buildings ablaze from incendiary bombs. … Ola, torch in hand, holding me tightly, grasped her little case already packed for such an emergency and went out into the street unaided. The descending darkness was illuminated only by searchlights, fires and her torch. Someone directed her to the nearest shelter. But the shelters were unbearable. This woman, with a baby only days old, door-knocked until she found a young couple willing to take her in. Miraculously, she was briefly reunited with Wladek, but as the author calmly puts it A peaceful night with both adoring parents beatifically leaning over my cradle was not my fate. Towards the end of the month, Hitler, watching fires consuming the city, demanded capitulation. It was rejected and punishment was meted out on the day remembered as Black Monday. Those who lived through it thought it signalled the end of the world, or what hell must be like. Nothing was spared from the relentless assault which lasted all day. Entire streets were on fire – houses, churches, hospitals, schools and markets turned to ruins. That day, ten thousand civilians were killed. From then on, there was no water and no electricity, no gas. But as we all now know, Hitler broke his pact with Stalin, and unleashed the full fury of the Soviets. Even less prepared for war than Britain, the USSR used all its resources to re-arm and to mount a counter-attack. Ola and Halina were separated from Wladek and were sent with prisoners-of-war further east to the town of Lida. But this was disastrous too, because under the German Occupation in 1941, the ghetto was liquidated and the community murdered in 1943. Ola and four-year-old Halina survived with other partisans in the surrounding forest until the city was liberated in 1944. One of the statements records the presence of ‘a four-year-old girl’ who was brought to the forest on the night of our escape. Whoever wrote it had no knowledge of to whom, if anyone, I was attached. I tell Valeri that the woman sitting in front of him is that four-year-old child. Now he wants to hear my mother’s life from me. Yes, this is the long version. I take a deep breath and begin. I have read quite a few war stories and stories from the Holocaust, but most of them have been by and about men. This story remained buried in boxes of letters, papers, photographs and notebooks for many years after Ola Rubin’s death, until Halina Rubin decided finally to explore them and uncovered her mother’s heroic history through painstaking reconstruction and arduous journeys to Poland and Belarus (Belarussia during the war, and originally part of Poland). Halina’s journey also involved a process of self-discovery as she began to realise that her own behaviour as an adolescent contributed to the impossibility of finding some answers. She did not always listen, she did not always ask the right questions, she did not always respect her mother’s courage and tenacity. When by a stroke of luck Halina met Vasilievich who confirmed her mother’s role as a nurse with the partisans, she was overwhelmed – it’s as if, until that moment, some part of her was resistant to her mother’s remarkable story – because it is such an incredible achievement. PS Check out our new website. You’re welcome, Anna:) The website looks very classy now! What an amazing story Lisa – I wonder indeed about all the refugees in the current world – a book like this may give some hope that it is possible to survive and rebuild your life. Great review.